One of the premier meets on the track and field summer circuit is about to begin. The AAU Junior Olympic Games are scheduled for July 28th to August 4th and will take place on the campus of Drake University in Des Moines, Iowa. There will be no shortage of Michigan-based talent making the trek west, as indicated on the athlete performance lists that were recently released. Perennial power house clubs Maximum Output and Motor City will both be bringing a large contingent of their top athletes and among the notables from Maximum Output will be hurdles specialist, Madison Eaton. Eaton is a rising senior at Lake Orion who is coming off of exceptional performances at last month's MHSAA State Championships LP-1 where she claimed a pair of third place finishes in the 100m hurdles and 300m hurdles events due to her pr times of 14.39 and 43.76. Eaton, along with her relay teammates Amani Nuels, Britten Bowen, Payten Williams and Tiff Garcia, will have an opportunity to test herself against a collection of the nation's best over the next week. She's intending to compete in the 100m hurdles, 400m hurdles, 4x100 and 4x400 races. 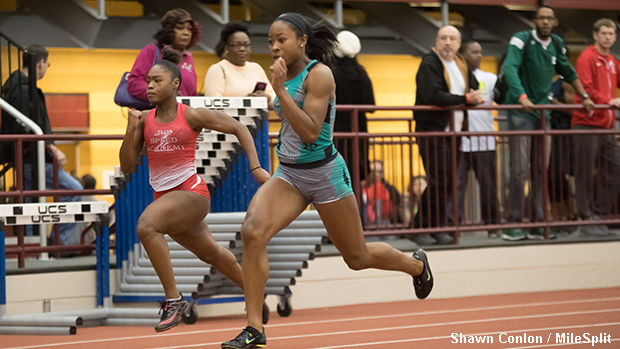 The New Balance Nationals Indoor, New Balance Nationals Outdoor and SPIRE Showcase veteran has a great deal of big meet experience that should pay dividends at AAU JO's. At the AAU Junior Olympics, I'll be running the 100m hurdles, 400m hurdles, the 4x100 and the 4x400. In preparation for the big meet, my summer training went well. I focused on my speed endurance and being aggressive while executing my race plans. My expectations for Iowa are to pr in my events, execute my races well and get on the podium! Madison Eaton also excels in the 60m, 100m and 200m events.